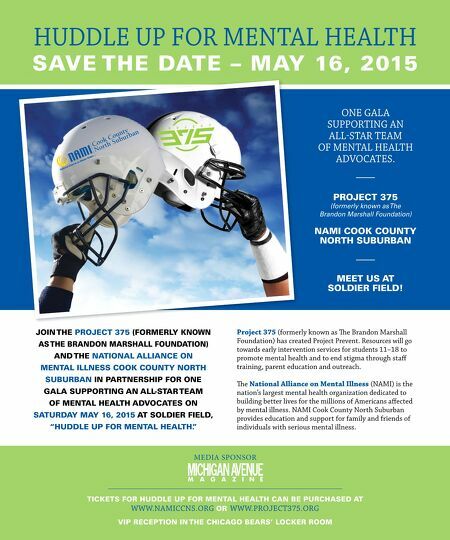 HUDDLE UP FOR MENTAL HEALTH SAVE THE DATE – MAY 16, 2015 JOIN THE PROJECT 375 (FORMERLY KNOWN AS THE BRANDON MARSHALL FOUNDATION) AND THE NATIONAL ALLIANCE ON MENTAL ILLNESS COOK COUNTY NORTH SUBURBAN IN PARTNERSHIP FOR ONE GALA SUPPORTING AN ALL-STAR TEAM OF MENTAL HEALTH ADVOCATES ON SATURDAY MAY 16, 2015 AT SOLDIER FIELD, "HUDDLE UP FOR MENTAL HEALTH." Project 375 (formerly known as T e Brandon Marshall Foundation) has created Project Prevent. Resources will go towards early intervention services for students 11–18 to promote mental health and to end stigma through staf training, parent education and outreach. T e National Alliance on Mental Illness (NAMI) is the nation's largest mental health organization dedicated to building better lives for the millions of Americans af ected by mental illness. NAMI Cook County North Suburban provides education and support for family and friends of individuals with serious mental illness. 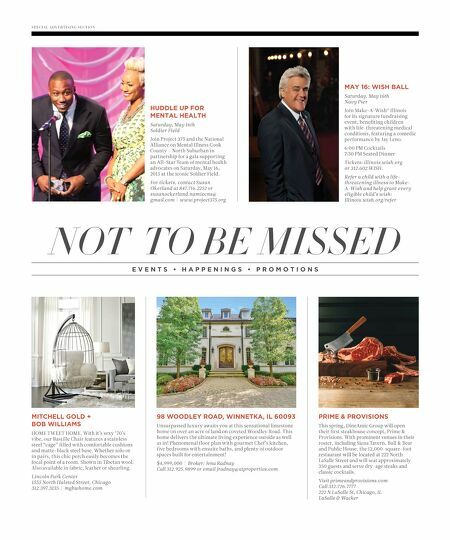 MEDIA SPONSOR TICKETS FOR HUDDLE UP FOR MENTAL HEALTH CAN BE PURCHASED AT WWW.NAMICCNS.ORG OR WWW.PROJECT375.ORG VIP RECEPTION IN THE CHICAGO BEARS' LOCKER ROOM ONE GALA SUPPORTING AN ALL-STAR TEAM OF MENTAL HEALTH ADVOCATES. PROJECT 375 (formerly known as The Brandon Marshall Foundation) NAMI COOK COUNTY NORTH SUBURBAN MEET US AT SOLDIER FIELD!